The content look like the following example. After I filled all my necessary information into the table, I started to write my code in an expert routine. First I need some variables and internal tables. After the variable declaration, we have to select our data and sort the internal tables. 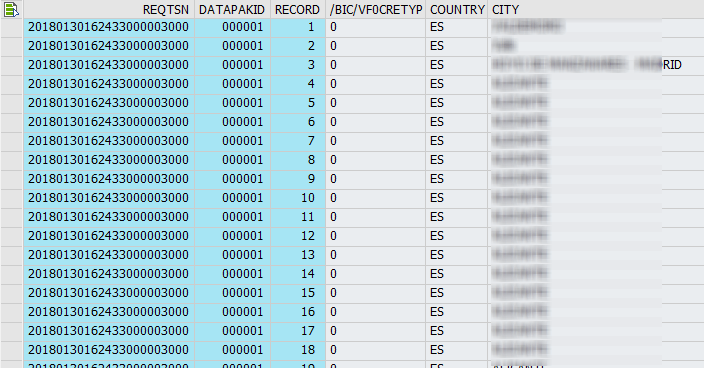 SELECT * FROM z_dec INTO TABLE lt_table0 WHERE recordtype = 0. SELECT * FROM z_dec INTO TABLE lt_table1 WHERE recordtype = 1. SORT lt_table0 BY startfrom ASCENDING. SORT lt_table1 BY startfrom ASCENDING. Now we loop over the SOURCE_PACKAGE and loop over our internal table to assign all values. LOOP AT lt_table0 INTO ls_table0. lv_start = ls_table0-startfrom - 1. ASSIGN COMPONENT ls_table0-infoobject OF STRUCTURE RESULT_FIELDS TO <fv_source>. "Here we append the RESULT_FIELDS to the RESULT_PACKAGE. LOOP AT lt_table1 INTO ls_table1. lv_start = ls_table1-startfrom - 1. ASSIGN COMPONENT ls_table1-infoobject OF STRUCTURE RESULT_FIELDS TO <fv_source>. So when we now see the import file, which looks like the following. The result looks like the a normal import. You can download the whole source code from github. If you have questions, feel free to ask.